Halloween blew my two years old’s mind. Totally blew it. 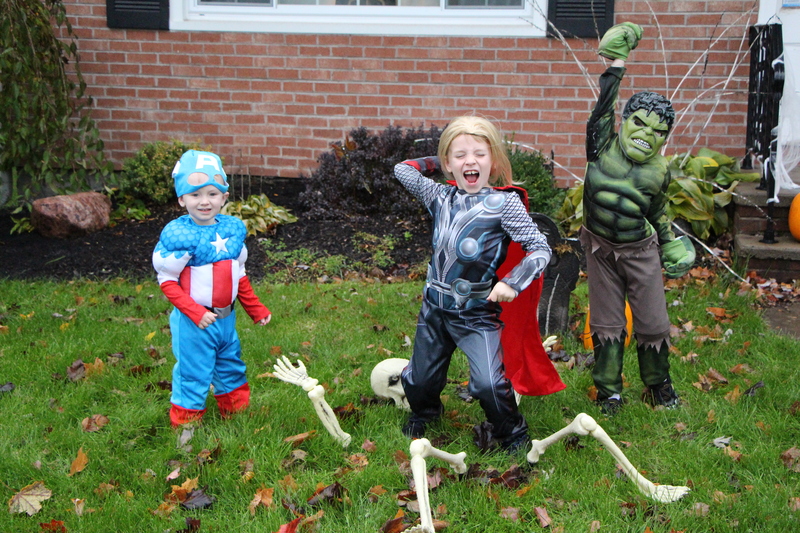 For weeks we’d been talking about how he would be Captain America on Halloween, while his brothers would be Hulk and Thor. Daddy would be Iron Man and Mommy would be Black Widow. We’d go door to door, collecting candy, which we would deposit in plastic pumpkins. As Halloween unfolded, every last bizarre detail came to fruition. He became Captain America. He was handed a plastic pumpkin. He said the magic words as he trotted from door to door. He got candy. Somehow, he managed to collect twice as much candy as either of his older brothers, having visited the same number of houses. Be Captain America. Get Candy. Meanwhile, Lucas, my five-year-old Hulk, obsessed over the accuracy of every minute detail of his costume. My initial money-saving plan of picking up a fleece Hulk hat, t-shirt, and green face paint was met with a long list of concerns about muscles, green arms, purple ripped pants, and green legs. I abandoned my frugal plan once the details overwhelmed me, in lieu of an official store-bought muscles-included hulk costume. Far from solving the problem, this purchase was quickly met by concerns over not having green feet or enough teeth in his partially toothless mouth. A hefty dose of gamma radiation may have saved us all a few headaches. Learn from my experience, folks… If you stick three little boys in superhero costumes and call them The Avengers, you’d better expect some major chaos. Thor’s hammer was revoked almost instantly. Somehow, we made it through the day, by the skin of our superhero teeth. Next year, I may dress our whole clan as librarians, monks, and sloths. Thankfully, the very next day, I had the pleasure of departing for a weekend of dairy education and wine and cheese tasting, hosted by the American Dairy Association and Dairy Council. Last year’s event was such an amazing experience. (You can read about it here.) I couldn’t wait to see what ADADC had in store for us this year. 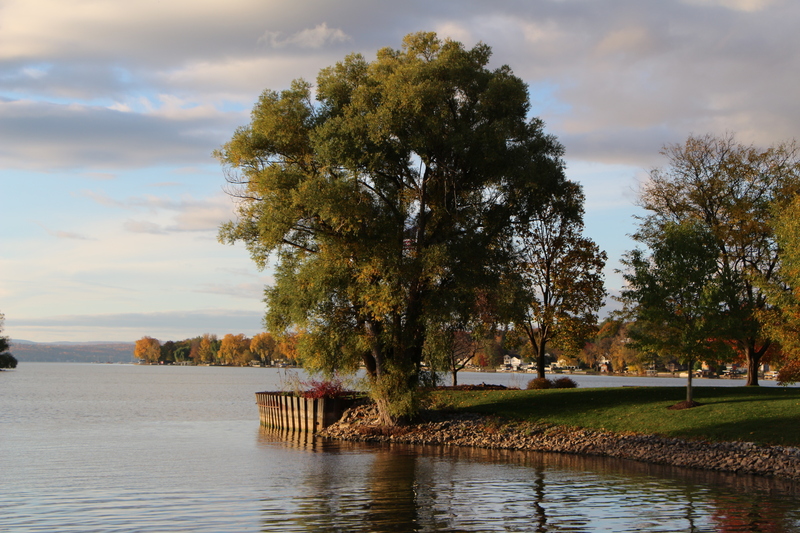 This year, the event began at the beautiful Geneva on the Lake in Geneva, New York, which is located on the northwest side of Seneca Lake. Nestled in the New York Finger Lakes wine country, the manicured grounds of this elegant villa-inspired resort are absolutely stunning. After a comfortable night’s sleep in a spacious jacuzzi suite, we awoke for a continental breakfast at the resort. From there, we departed for Cornell University, where we spent the day touring Cornell’s state of the art dairy farm and dairy production plant. We met with experts in the fields of dairy farming, food science, and dairy production. Going a step beyond the dairy farms, we learned about ice cream, cheese, and yogurt making and how Cornell University partners with local cheese artisans and other small business to help them develop and promote their dairy products. Part of our ‘learning’ required tasting a variety of ice creams, frozen yogurt, homemade yogurt, and cheese. I had no choice but to eat that delicious ice cream and a second helping of cheese. Twist my arm already! For today, let’s start at the beginning, with the cows. 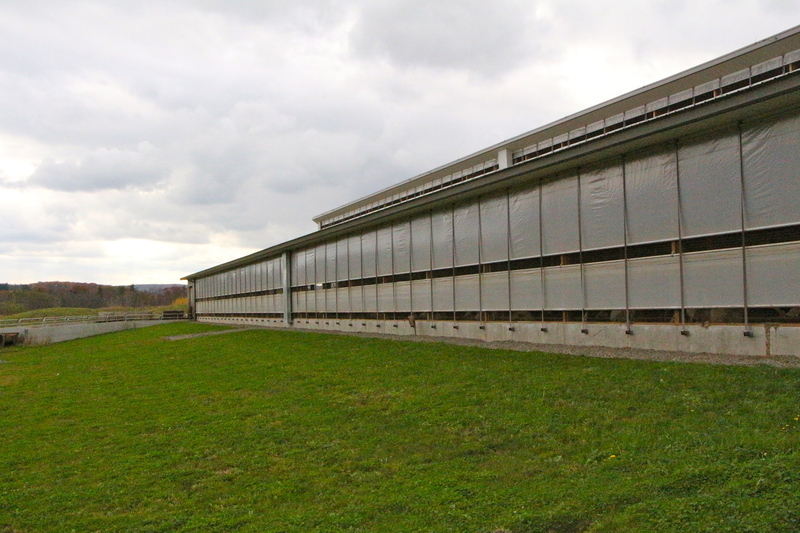 During our time at Cornell, we had a chance to visit their state of the art dairy farm, where approximately 150 cows roam within the freestall barn, resting on comfortable beds of beach sand and enjoying pleasant back-scratching from the automatic back scratchers placed throughout the barn. Any mom who has ever nursed a baby knows that milk production is at its best when the mom is well-nourished, well-rested, and comfortable. Same applies to dairy cows. Happy cows means more milk and these dairy farmers have mastered the art of keeping cows happy and healthy to maximize production. 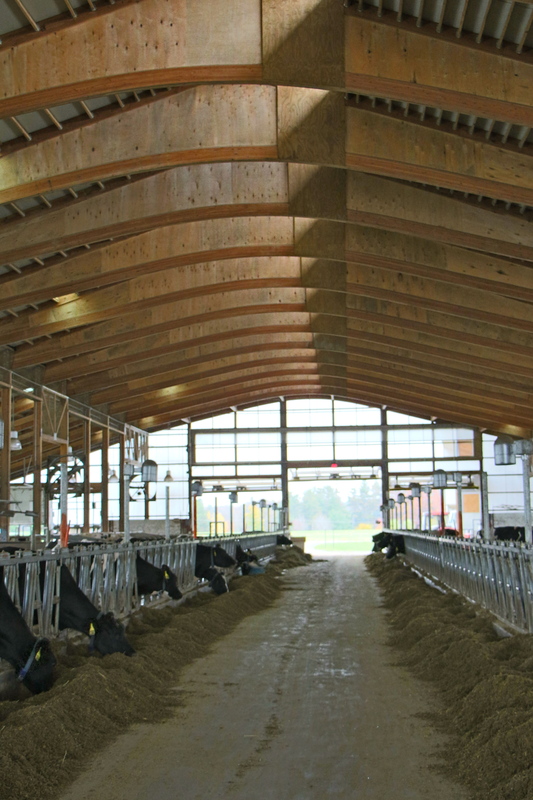 Cornell’s dairy barn, which is designed for maximum ventilation, sanitation and cow-comfort, sets an example for the dairy industry and provides a hands-on learning opportunity for its dairy students. Three times a day, Cornell’s cows are brought to the milking parlor, where their milk is collected for use within the school’s very own dairy production plant, where Cornell’s own ‘Big Red’ cheddar is made, as well as yogurt and ice cream for the university’s dining halls. Twice daily milking is standard for most dairy farms, but Cornell’s cows, much like its students, are overachievers. Each cow produces an average of 95 pounds of milk daily, putting them in the top 95th percentile for milk production. I’d expect nothing less from an Ivy-league cow! As each cow arrives in the milking parlor, its health records are electronically reviewed to ensure that the milk from any cow being treated for an illness is never mingled with the rest of the milk supply. Maintaining the safety of the food supply, from milking to production is a top priority. The level of careful planning and practice which goes into the entire process of dairy farming is seriously impressive. As a dairy consumer, it’s comforting to get a closer look into where my food comes from. And as someone who has a soft spot for animals, it’s reassuring for me to learn that cow comfort is intrinsically linked to milk production. Happy cows really do produce the most milk. In Part 2 of my dairy adventure, I’ll talk about two things which I love dearly: cheese and Wegmans. 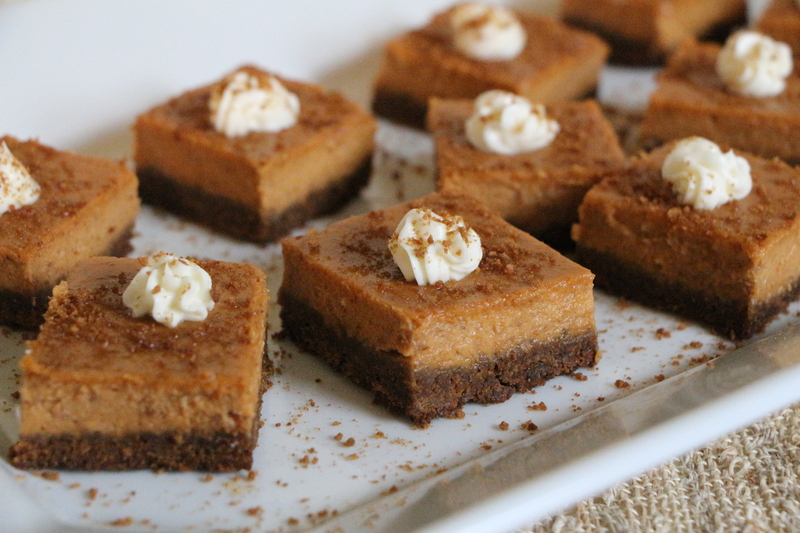 For today, enjoy some pumpkin gingersnap bars. 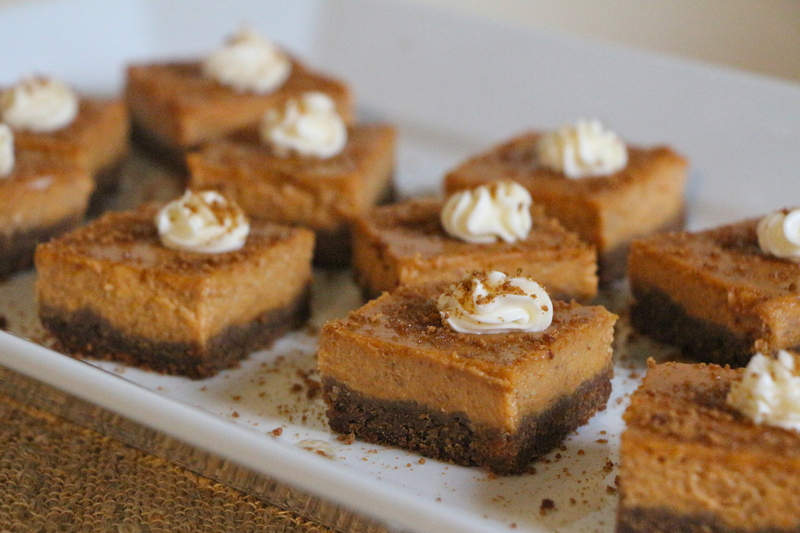 These seasonally perfect pumpkin bars pair a spicy gingersnap cookie crust with a layer of luscious baked pumpkin custard. Creamy half and half (half cream/half milk) lends a satisfying richness to these tiny bites of gingery pumpkin bliss. Cream cheese, another of dairy’s mouth-watering contributions to the world of food, provides the perfect finishing touch. Combine the crushed gingersnap crumbs with the melted butter. Press in an even layer into the bottom of a 13×9 inch baking dish. Bake for 7-8 minutes. Remove from the oven. Meanwhile, whisk together the pumpkin, the sugars, half and half, eggs, vanilla, cinnamon, ginger, salt, nutmeg, and cloves, until well blended. In a small dish, combine the cornstarch with about 1/4 cup of the pumpkin mixture, until the cornstarch is completely dissolved. Whisk the cornstarch mixture into the pumpkin mixture. Pour the pumpkin mixture over the gingersnap crust. Remove from the oven. Cool at room temperature until no longer hot. Then, cool completely in the refrigerator. Cut into small 1- 1 ½” squares. Combine the cream cheese, powdered sugar, and a pinch of ground ginger. Use a pastry bag to pipe a bit of the cream cheese topping onto each square. Sprinkle with extra gingersnap crumbs. This dairy tour and wine and cheese getaway weekend was hosted by the American Dairy Association and Dairy Council. As part of this event, they provided me with accommodations, meals, and compensation towards travel expenses. 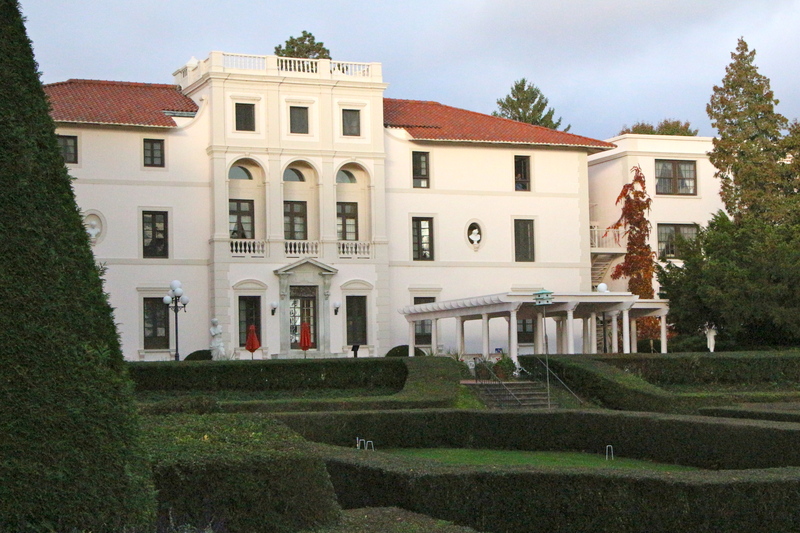 I was under no obligation to the ADADC, Cornell University, Geneva on the Lake or any other agency. All opinions and observations are my own. 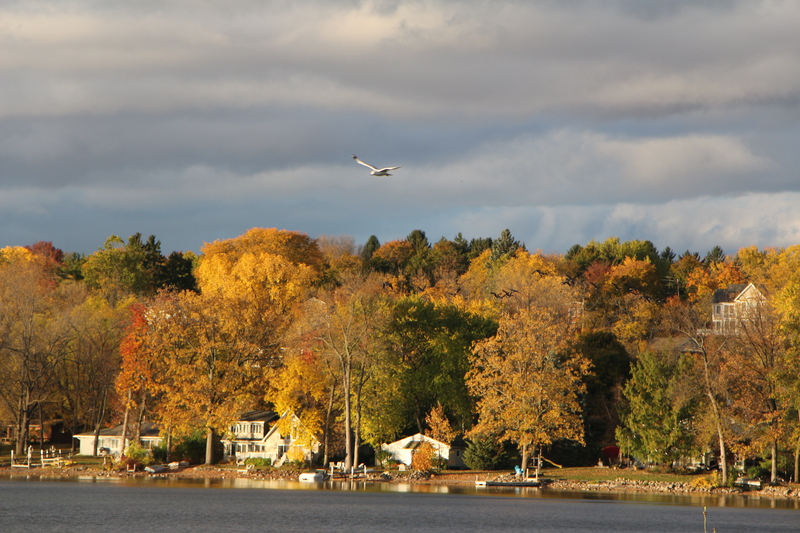 Posted in Food and tagged agriculture, american dairy association and dairy council, baking, cheese, cornell, cows, dairy, dairy production, farming, food safety, geneva on the lake, pumpkin, Recipes. Bookmark the permalink. Delicious Dairy Round-Up and a Giveaway!! In many ways, I’m an overly trusting person. I’m an optimist by nature and I tend to assume the best in people, almost to the point of foolishness. It’s the way my brain (and maybe my heart?) works and it can be both a benefit and a curse. Because my personal belief system comes from a place of trusting that most people are honest, moral, ethically-minded people, I sometimes fail to ask the questions I ought to ask. And when it comes to the food I feed myself and my family, I really should be asking more questions. Like most of us, I strive to feed my family a well-balanced, nutritious diet which is mostly composed of whole foods. I try to stay aware of current findings in nutrition research and I use that information to make the choices I feel are best for my family’s needs. But sorting through the vast amount of information, which is easily accessible in today’s modern technological age, can be positively confusing. You can find a strongly-worded, research-based article full of references and evidence, to support or refute just about any claim. Add that to the fact that as technology changes and new information becomes available, widespread belief systems about what’s healthy or not change. Remember when eggs were bad for you? Or margarine considered healthy? Or fat-free products the ticket to healthy living? It’s a moving target. On top of all of that, you then need to contend with the difference between what medical professionals tell you and what you heard from your neighbor’s best friend’s former schoolmate. It’s absolutely overwhelming, even to a well-educated adult with a background in biochemistry and an avid interest in food. Most of us want to do the right thing when it comes to our family’s well-being. But in an age of way too much information, where it’s almost impossible to sort fact from fiction from personal preference, identifying that ‘right’ thing can be downright perplexing. You can’t win. In fact, I stopped trying to win. Ultimately, I end up basing most of our choices on the bits of information which seem the truest and our own personal evidence. If my family appears and feels happy, healthy, and well-nourished, I consider our choices a success. If something isn’t working, we look for the culprit and go after it with our fiercest ninja moves. For myself and my family, dairy products have always been a part of our diet, which we all enjoy and thrive on…our personal evidence. The kids drink milk, we use it in our cereal, we love ice cream and yogurt, and you might as well crown me the ambassador of cheese. (Make it an extra sparkly crown, please!) Convincing me to like dairy was never an issue. So, when I was invited to attend a NY Dairy Farm to Table event hosted by the American Dairy Association and Dairy Council, which would involve touring an upstate NY dairy farm, followed by eating cheese and drinking wine, along with two uninterrupted nights of sleep in a comfy hotel room, nobody had to twist my arm real hard. 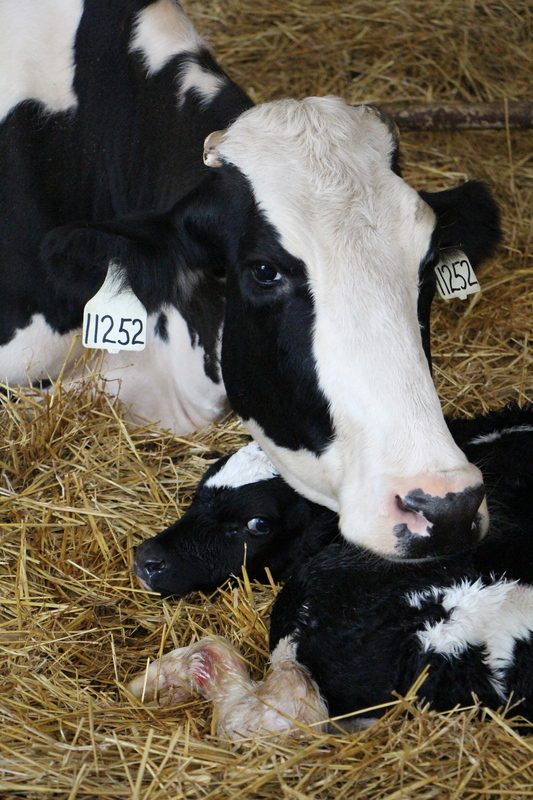 Mama cow and her calf, just a couple hours after the birth, comfortably resting in a clean stall. I eagerly accepted the invitation, certain it would be an enjoyable (and yummy) experience. What I hadn’t counted on was how positively eye-opening the experience would be and how it would answer so many of the questions I hadn’t taken the due diligence to ask. I walked into the experience thinking about cheese, delicious cheese. I walked out of the experience feeling absolutely blown away by the level of planning, thoughtful practice, and monitoring, that goes into producing the safe and nutritious milk which ends up on our store shelves and is used in some of our other favorite dairy products. (Yes, I’m thinking about cheese again.) I have a new found appreciation for the animals who provide us with the food that many of us enjoy on a daily basis and for the hard-working farmers who care for those animals in order to get a plentiful supply of that food to our families’ tables. I’ve tried really hard to prioritize my thoughts, but there are just so many things I want to share with you. So, pour yourself an icy cold glass of milk (perhaps a few cookies on the side for dunking) and stay tuned until the end, where I’ll share links to my top ten favorite Gourmand Mom recipes featuring dairy and an awesome giveaway! 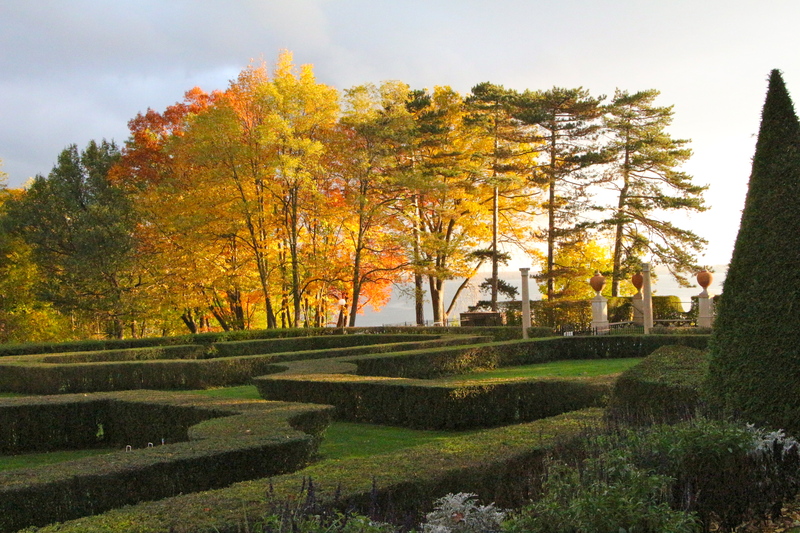 We spent the morning at Noblehurst Farms in Linwood, NY. 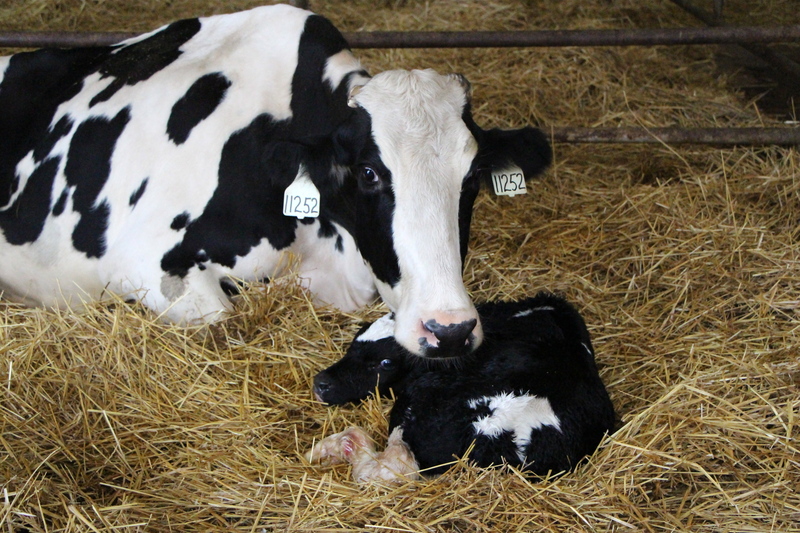 Noblehurst is a large, modern, seven-generation multi-family dairy farm. They care for and milk 1700 cows to produce a daily yield of approximately 15,000 gallons of milk. Most of the milk produced at Noblehurst Farms is sold to Steuben Foods in Elma, NY for yogurt production or Sorrento in Buffalo, NY for mozzarella cheese. Mmmm….cheese. Seventh generation dairy farmer, Kitty Noble Rudgers, co-owner of Noblehurst Farms in Linwood, NY, (who I should note is currently thirty-six weeks pregnant with the eighth generation of Noble dairy farmers), hopped on a hayride along with Noblehurst’s cow nutritionist and dairy manager to show us how Noblehurst produces those 15,000 gallons each day. 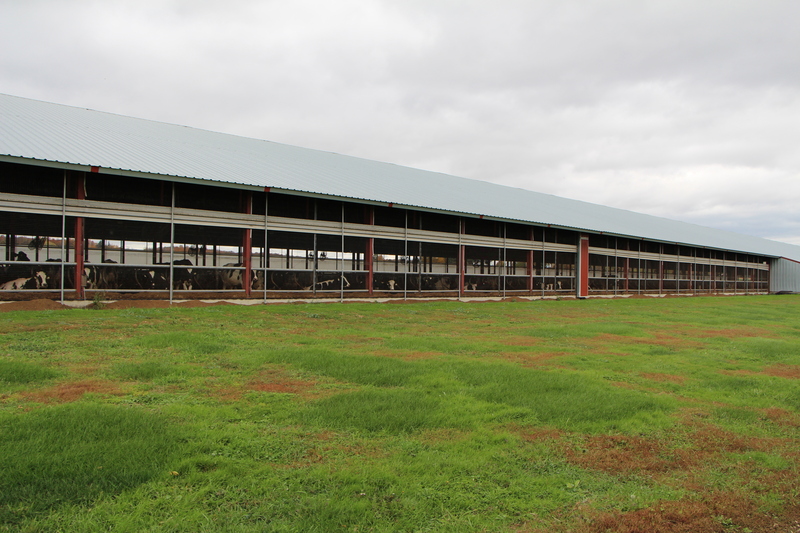 We toured their vast property from where they grow the food which feeds the cows, to where they ferment and store the cows’ food, to the digester that turns the cow’s waste into energy which can be transferred back into the power grid. We visited a large barn where many of the cows are housed, the milking parlor, and the barn where calves are born and raised. (I pet a baby cow. He mooed. I considered adopting it.) Afterward, we had the opportunity to meet with the veterinarian who cares for the herd as well as the CAFO (Concentrated Animal Feeding Operations) planner who works with the farm to ensure they are meeting or exceeding all standards for keeping our environment safe. Young calf, resting with other young calfs. 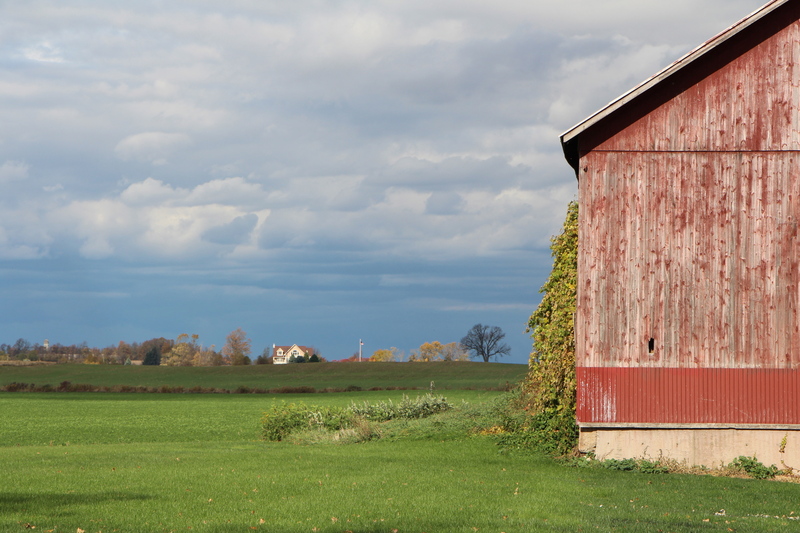 The vast majority of farms across NY and the nation are family owned and operated. This just makes me feel good when I’m thinking about the food I feed my own family. It sort of makes me think back to a time when every family owned their own cow for their family’s milk and eventually meat. Nowadays, very few people own their cow, but we’ve got these farm families who were born and raised on dairy farms and are now providing the rest of us with delicious dairy. Anyone who’s ever nursed their baby can attest to the fact that comfortable, happy, and well-nourished moms make the most milk. Well, same goes for cows. Comfortable, stress-free, healthy cows produce the most milk, so if for no other reason than profitable business, it is in the best interest of the farmer to take darn good care of their cows. Cows are fed a carefully crafted blend of food which is optimized for their overall health, taste preferences, and milk production. Each cow eats approximately 90-100 pounds of food every day along with a bathtub’s quantity of fresh water. Holy cow…90-100 pounds?!?! I’m rethinking my desire to adopt a cow. All dairy products are antibiotic-free. Sick cows on conventional dairy farms may be treated with antibiotics, when necessary, just as doctors may prescribe them for ourselves or our family members when needed. But milk from these cows is not allowed to enter our food supply. Multiple levels of safety screening occur at both the farm level and production plant level for every batch of milk to ensure that antibiotic-tainted milk does not end up on our store shelves. Loads of milk which test positive for antibiotics are dumped, at great cost to the farm, so it’s not something that anyone takes lightly. The use of artificial growth hormones to increase milk production is a concern to many people, who worry it may enter the milk and cause adverse affects in our bodies. I hear ya! Though the FDA has found no significant difference in the quality of milk from cows treated with artificial growth hormones as compared to the milk from untreated cows, I’d always rather lean towards the side of extra caution when it comes to my family’s safety. The good news is that while use of these hormones is currently still allowed in the United States, most dairy farmers (including Noblehurst Farms) are responding to consumer demand by eliminating the use of artificial hormones in favor of optimal nutrition practices. Weeeeeeee…a carousel ride for cows! 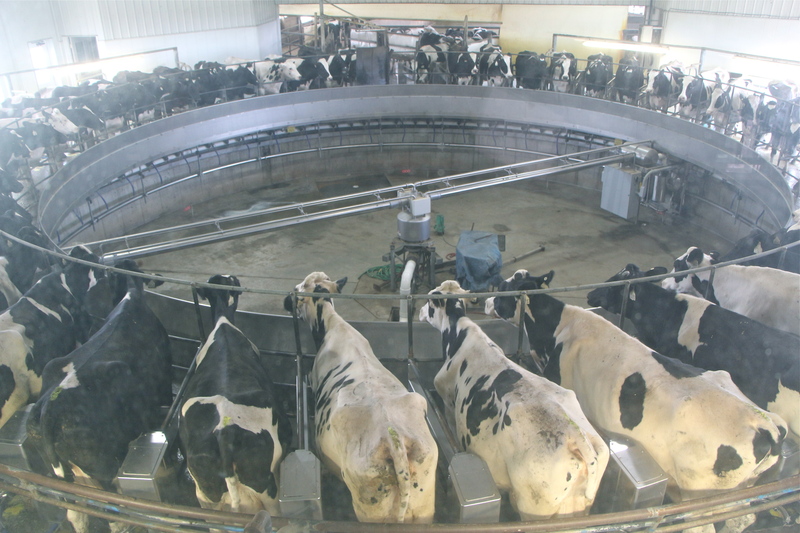 Dairy cows are not over-worked milk machines. In fact, they spend a very small amount of time being milked each day. 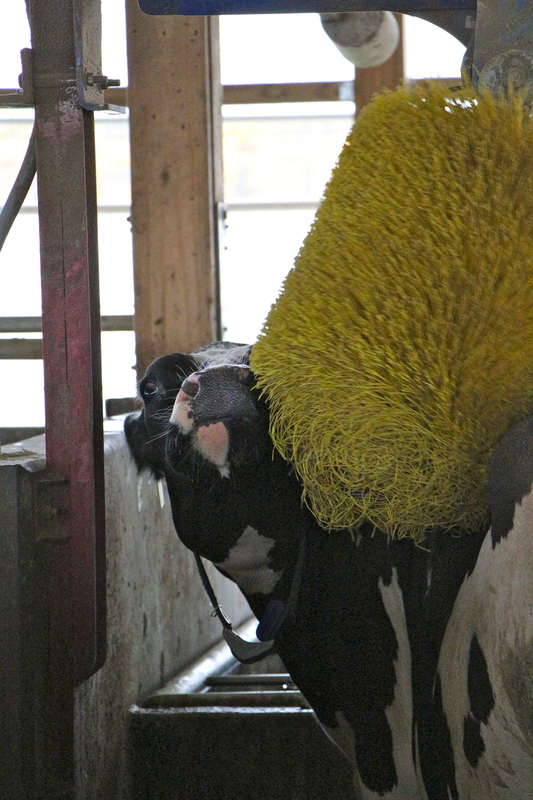 Cows at Noblehurst Farms are milked three times each day on a rotary carousel milker. They step onto the slow moving carousel, are examined for any signs of infection or health concerns, are sanitized, then hooked up to the milkers. The milkers automatically fall off once the cow’s flow reduces to a certain level. They finish their ride on the carousel, then step off and spend the rest of their day eating their carefully crafted diets and resting on comfortable beds in their stalls. The entire process takes nine minutes. Multiply that by the three milking cycles each day for a total of twenty-seven minutes spent in the milking process. And on average, they get about two months off from milking each year. Doesn’t sound like such a bad deal to me! I nursed my three sons and let me tell you…I spent a heck of a lot more than twenty-seven minutes being milked each day and I certainly didn’t get all of that time for resting and eating in between or the two months of vacation time! Rotary milkers aren’t the only modern technology being used for efficiently milking large groups of dairy cows. 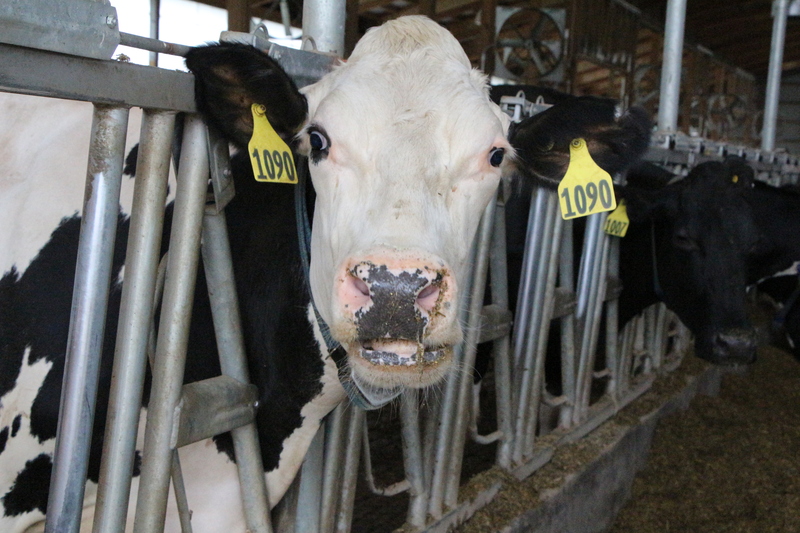 We met a pair of local dairy farmers who use robotic milkers. With robotic milking, the cows roam freely and can choose to enter the milking stalls as they wish, as often as they wish. 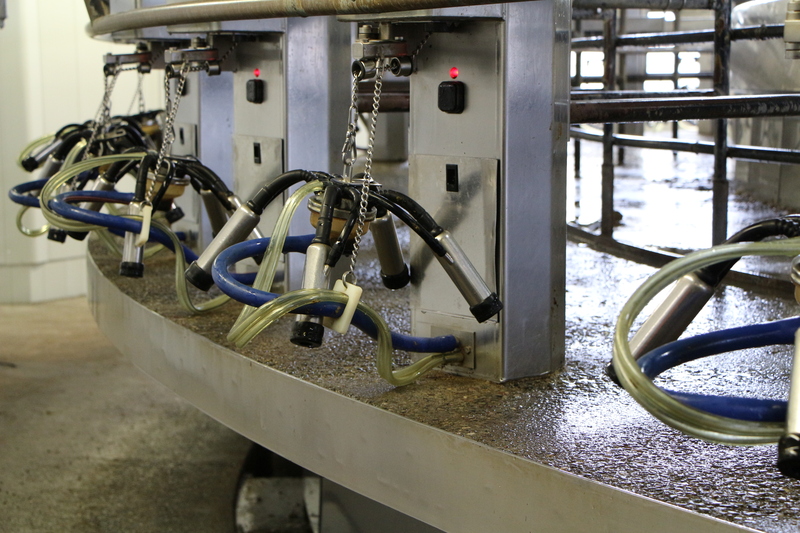 Once in the stall, the robotic milking system automatically cleans the cow for milking, attaches, and effectively milks the cow. It’s even capable of recording coordinates for each individual cow so that it can more easily identify the correct placement of the milkers each time that cow enters the stall! How cool is that?? But the funny thing is that apparently, some cows enjoy this process so much, they choose to enter the stalls for milking many more times than necessary each day! Silly cows! All milk is healthy, wholesome, and nutritious. – Whether you choose organic or conventional milk, whole, reduced-fat, or skim, you’re getting those nine essential nutrients: calcium, vitamins A, D and B12, protein, potassium, riboflavin, niacin and phosphorus. And did you know that whole milk is actually only 3.3% fat?? Personally, I’m a skim milk girl, but if you prefer the fuller body of whole milk, there can certainly be room for it within the framework of a healthy balanced diet. I loved dairy prior to this experience. It would have put a serious damper on my love affair with cheese to have observed anything other than the remarkably well-designed, efficient and sustainable production they’ve got in place at Noblehurst. Instead I walked away feeling more confident than ever about the dairy products I feed myself and my family. Seeing it all firsthand, I am reminded to be mindful of where our food comes from. It’ll be hard not to think about those adorable and generous cows every time I enjoy some delicious cheese! In honor of this awesome experience, I’ve put together a round-up of some of my favorite recipes featuring delicious dairy! Give them a try! The American Dairy Association and Dairy Council is offering a gift bag of dairy-themed items for one lucky reader! 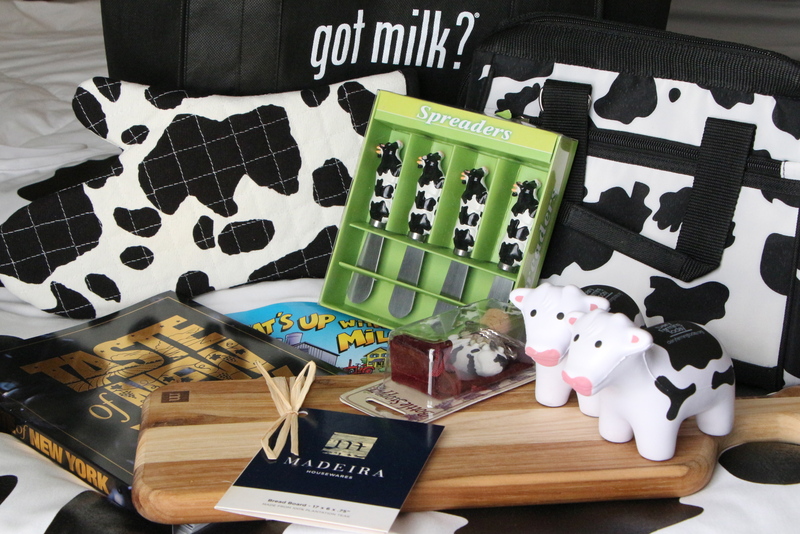 It’s an awesome bag of goodies, including a cow print apron and oven mitt, a gorgeous wooden cheese board, cow cheese spreaders, a cow wine cork, little squishy cow toys, a sturdy cow-print lunch bag, and a Taste of New York cookbook! To enter, simply leave a comment on this post telling me your favorite cheese or favorite use of dairy products. The contest will close on Saturday, November 3 at 12:00pm EST, at which point a winner will be randomly selected. 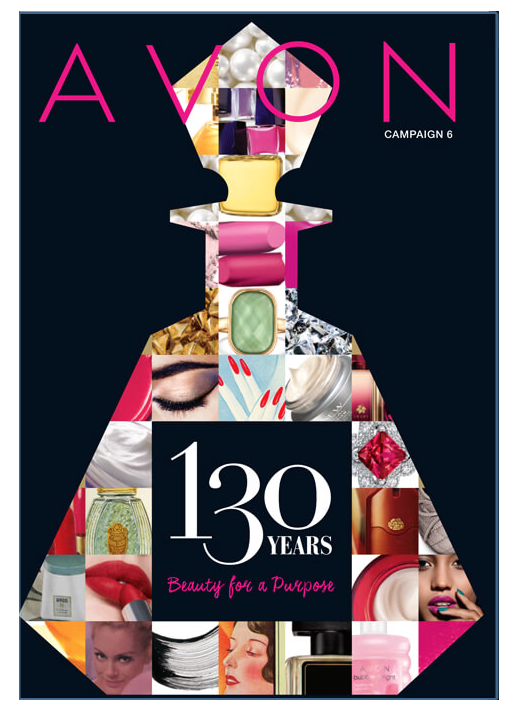 One entry per person, US mailing addresses only, 18 years or older please. 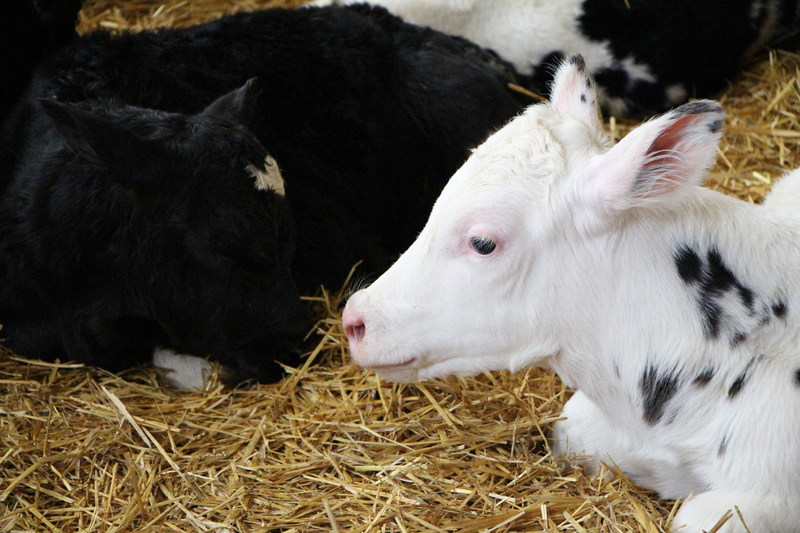 The American Dairy Association and Dairy Council hosted the NY Dairy Farm to Table event. As part of this event, they provided me with accommodations, compensation towards travel expenses, a gift bag of dairy-themed goodies, and a delicious evening at the NY Wine and Culinary Center. I was under no obligation to the ADADC, Noblehurst Farms, or any other agency to write this post or in any way share my experiences. Posted in Food, General Rambling and Such, Things I Love and tagged cheese, cows, dairy, family, farming, Food, milk, New York, nutrition, parenting, yogurt. Bookmark the permalink.